Blessings of the Emerald Isle are as timeless as love. Now, award-winning artist Donna Lee creates her first jewelry keepsake capturing the charm and beauty of this classic Irish blessing. 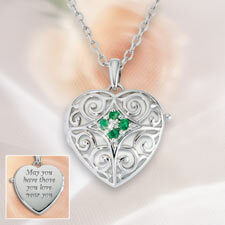 A jeweled symbol of eternal love, this finely crafted Sterling Silver heart locket features a perfect four leaf clover of four vibrant green Emeralds (.15 Carats) centered with a sparkling Diamond to keep the one you love close to your heart. Truly a keepsake to treasure for years to come.